Open Studio is a free, open-source solution for game recording and live streaming. The application is expertly designed to enable users to work with multiple sources and mix between them to create a seamless broadcast. It enables you to not only record right from your microphone and webcam, but also incorporate existing videos, capture the whole window or a part of your screen, and add in footage from games. The lightweight and easy-to-use program that guarantees high-quality performance for commercial and non-commercial users. This cross-platform application provides a set of great features which include: intuitive audio mixer, multiple video sources filters, powerful configuration option, streamlined settings panel, multiple themes, and real-time audio/video capturing and mixing. OBS Studio is a powerful program that provides out-of-the-box features for intuitive screencasting. Often, free software lack the depth of features required for smooth broadcast, but that is not the case with OSB Studio. Although the program is 100% free, it offers all the important features that make online broadcast distinctive. It delivers a high performance that can easily rival the pricier options. Above all, the application support streaming to multiple places including Facebook live, Hitbox, Twitch, YouTube Live, and more. Its clean interface maintains the unparalleled ease of use. The easy to read interface enables users to add capture cards, specific windows images & sources, and more. The simplicity with which you can add multiple source is noteworthy. Besides, the interface provides multiple settings for configuring virtually all aspects of your live stream. Another commendable feature of OBS Studio is its high-quality video capture. The software eliminate any concern with the number of frames per second (fps) captured and the video quality. It gives you the freedom to customize the capture quality, you easily set your resolution or go by that of your monitor. In addition, it’s easy to set your own fps and apply a resolution downscale of your choice. OBS Studio makes it easy to tinker with the different recording and live streaming settings to find the best possible option. The application also allows you to add text and logo to the live videos with ease. If you are interested in OBS Studio it might also be beneficial to examine other subcategories of Best Video Editing Software collected in our base of SaaS software reviews. Organizations have different needs and requirements and no software application can be perfect in such a scenario. It is pointless to try to find a perfect out-of-the-box software product that fulfills all your business needs. The wise thing to do would be to modify the system for your specific wants, staff member skill levels, budget, and other factors. For these reasons, do not hasten and pay for well-publicized leading solutions. Though these may be widely used, they may not be the perfect fit for your specific needs. Do your homework, check out each short-listed application in detail, read a few OBS Studio reviews, call the maker for explanations, and finally choose the application that presents what you need. How Much Does OBS Studio Cost? 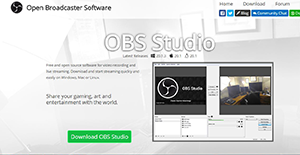 OBS Studio is a reliable open source software that can be downloaded for free, and comes with no enterprise pricing plans for users to choose from. We realize that when you make a decision to buy Video Editing Software it’s important not only to see how experts evaluate it in their reviews, but also to find out if the real people and companies that buy it are actually satisfied with the product. That’s why we’ve created our behavior-based Customer Satisfaction Algorithm™ that gathers customer reviews, comments and OBS Studio reviews across a wide range of social media sites. The data is then presented in an easy to digest form showing how many people had positive and negative experience with OBS Studio. With that information at hand you should be equipped to make an informed buying decision that you won’t regret. What are OBS Studio pricing details? What integrations are available for OBS Studio? OBS Studio integrates with the following application. If you need more information about OBS Studio or you simply have a question let us know what you need and we’ll forward your request directly to the vendor.